I commute into London everyday all year round, so when it comes to helmets I need something that didn’t just look good but also practical. Spurred by previous helmets being noisy, leaking rain, lacking Pinlock and other annoying niggles, I decided to splurge out on a premium lid. 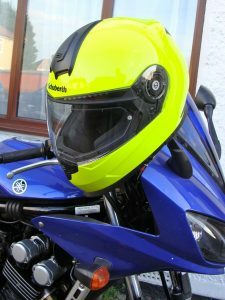 I was drawn to Schuberth due to their rep for being good quality and really quiet as being big into my music, hifi and home cinema I was keen to keep my hearing in good shape. I also wanted a design that would stand out and help me be seen on the road. 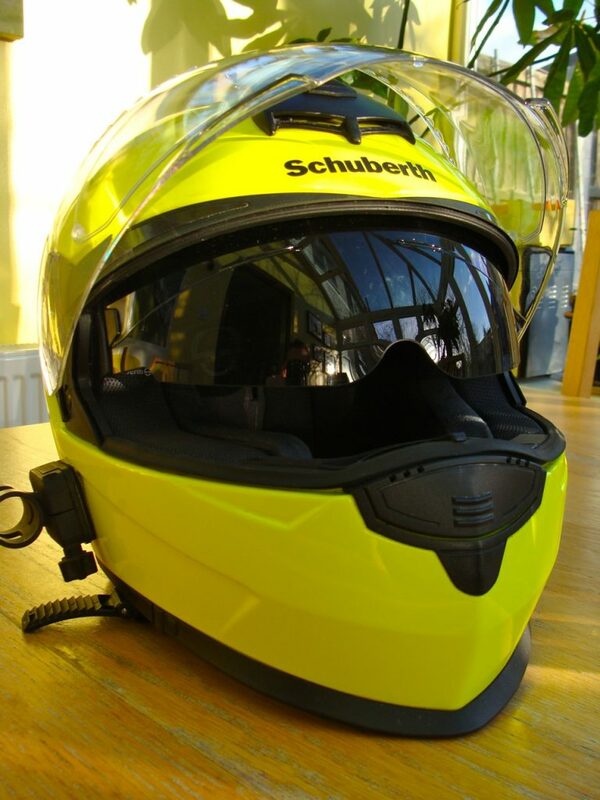 Helmet City had a number of Schuberth lids heavily reduced last Autumn (~£200 off! ), so I just had to check them out. I was initially torn between the S2 and the SR1, the former more touring orientated, the latter designed for the track. 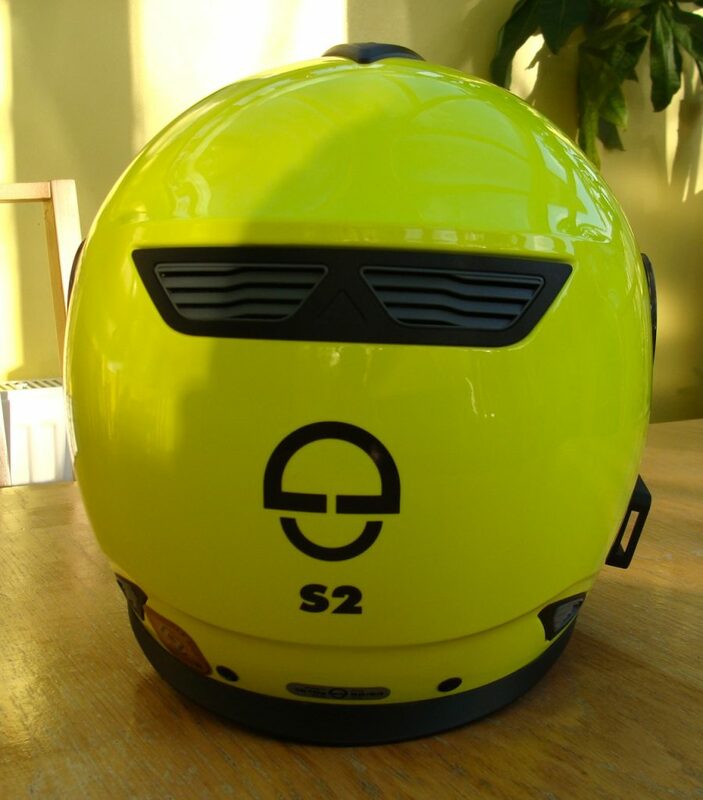 The S2 featured a drop down sun visor, whereas the SR1 was lighter and had an extra star on the SHARP rating. Ultimately it boiled down to what was available in my size (XS), wasn’t black and was discounted down to my £300 budget, hence I ended up with this High-Vis S2. That was last October, so after wearing it daily on my work commute since, I’m going to give you my verdict. On popping the helmet on first time, it felt super snug. Double checked by the helpful chaps at Helmet City I was assured it was a good fit and the next size up was too loose. I was told it would loosen slightly after a few weeks, and yes it did. But the main reason it felt tight putting on was the extra padding around the neck line. This is great as it helps keep the noise levels right down and keeps you head lovely and warm. It is however one huge piece, so you can’t remove a little from the front like on some other lids. But crucially it means my breath can’t escape so my glasses steam up a lot when stationary on these freezing cold winter days. About those noise levels; yes the Schuberth is quiet, far more than my previous Bell M3R and AGV K4, it isn’t silent, don’t let the Schuberth reputation give you false expectations. 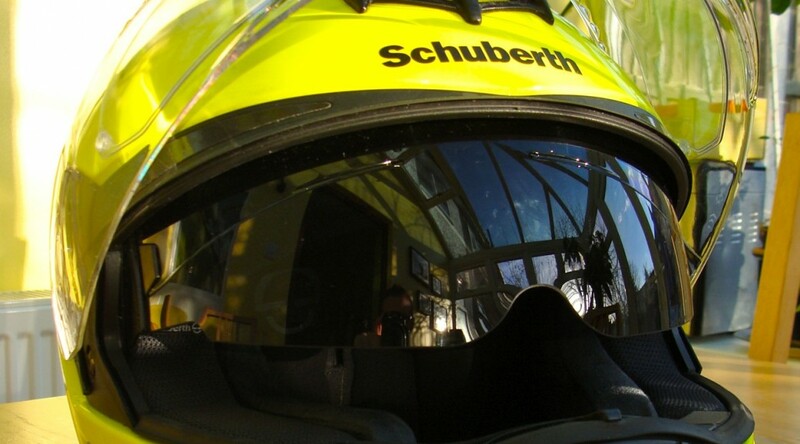 …it isn’t silent, don’t let the Schuberth reputation give you false expectations. I often still wear ear plugs on top, but it is a hell of a lot better than many lids. Mind the mass of neck padding as this can often dislodge plugs when donning the lid. Opening the vents doesn’t increase noise levels much and they do a good job of keeping you cool. The chin vent is great for keeping your glasses from steaming up. The top vent really cools you down, but is a little tricky to operate with gloves whilst on the move. The visor is top notch; clear, leak free, Pinlock supplied and it can be opened/closed with fat gloves easily. The drop down sun visor is useful, especially this time of year when the low winter sun can suddenly blind you. On the downside, the sun visor can steam up in cold weather when stationary and doesn’t drop down quite enough, so the lower edge can distract slightly. 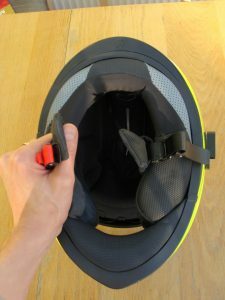 Schuberth do use a number of different size shells for the range of sizes, but the helmet does sit quite high, due to chin guard and neck padding extending down more than many other lids. Fine when wearing, but to fit it inside my Givi 52Ltr Maxia top box it has to go on it’s side and even then only just fits. Cost, even when discounted it’s not cheap. Just a 3 Star SHARP rating. Neck padding causes my glasses to steam up. Sun visor lower edge isn’t low enough, so can distract. Only just fits in my 52Ltr Maxia Givi Box when on the side. To conclude, I’m very happy with the S2, it is a top quality lid with tonnes of great features that really help me ride in all conditions. It’s not quite perfect, but definitely the best lid I’ve owned and I’d gladly buy another. And of course a big thumbs up goes to Helmet City for their fitting help, service and competitive price. If you’re quick, you can grab your a Schubeth S2 lid discounted at Helmet City here.